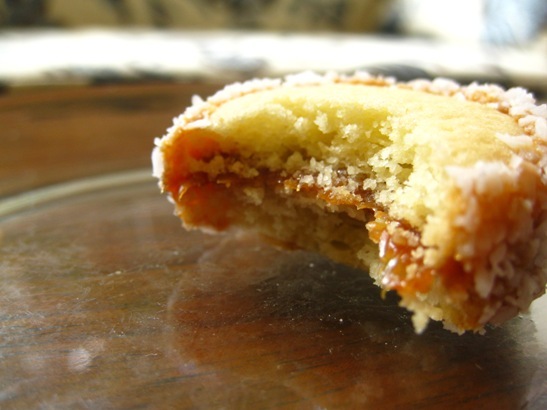 If you’ve never had a dulce de leche cookie sandwich, also known as an alfajores in Spain and Latin America, now is the time. Thanks to East Village newcomer Zucker Bakery, you can get what I’m sure will be a regular fix for just $2 per bite-size cookie. And there will be a lot of bites, because these buttery cookie sandwiches are held together by chewy caramel and rolled in coconut. Eat them with your morning coffee (Zucker serves Stumptown), as a mid-afternoon snack or post-dinner dessert. Whatever you do, don’t waste any more time, these may be the best bite-sized desserts in the East Village. I’m not one to fancy desserts but this looks good. Any other recommendations at this bakery? I also tried the rugalech and the sticky bun with date paste and halvah, and while both were really fresh, neither blew me away. I hear the sticky bun with chocolate is really good though. what makes the sticky bun so sticky? Your tears, Sal, your tears. Sounds delicious. Certain worth a walk East one morning. On a similar note if dissimilar texture. I recommend with body and soul the Dulce de Leche gelato made at Cones on Bleecker. To my mind the best gelato in the City. They’re Argentines and know what they’re doing. Thank you NYC Food Guy for the support and the report of our business. We welcome all of you to come or come back and try our home made pastries and our coffee is great too. Saturday – Sunday 9am to 6pm. Zohar, you should put the opening hours on your website! it was quite hard to find them online and I made a trip downtown today, Monday, thinking it was open. I was so sad it was closed. Is this place new? I fancy myself quite knowledgeable about bakeries in the area but I’ve never heard of Zucker’s. I haven’t had that many alfajores but MarieBelle makes a really nice one. Food Guy where are you we miss you. So YUM. Actually prices are $1 per goodie not two. Try the date-filled…Ok dunno what these are exactly but they are crescent shaped and out of this world. Next on the agenda: A Stumptown cappucino. Here I haven’t find link of zucker bakery. So I have share there official site in title. You can visit it for Espresso Bar NYC.